Since the 1980s, The Bradford Factor has been an industry recognised formula used in human resource management as a means of measuring employees’ absenteeism. It works on the theory that short, frequent and unplanned absences are more disruptive to work patterns than fewer longer absences. A = the number of independent absence periods over the time period. D = the total number of days absence during the time period. As you can see, the formula helps to highlight the disruption caused by frequent, short absences such as ‘sickies’. Focus Software creates Bradford Factor reports for you, over any time period or employee group you choose. 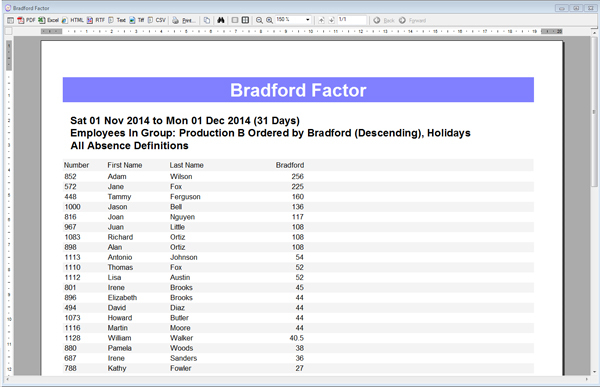 Bradford Factor reports can be used in a number of ways. You may wish to set a ‘trigger’ amount, a number that if reached will action a meeting or even disciplinary action with the employee. You can also use Bradford Factor ratings to assist in back to work interviews after absences and as part of an employee’s annual performance review meeting or pay review. Although the Bradford Factor is not intended to be a single solution in identifying problem employees, it is a useful tool that can be used in conjunction with others to make an effective contribution to staff management.